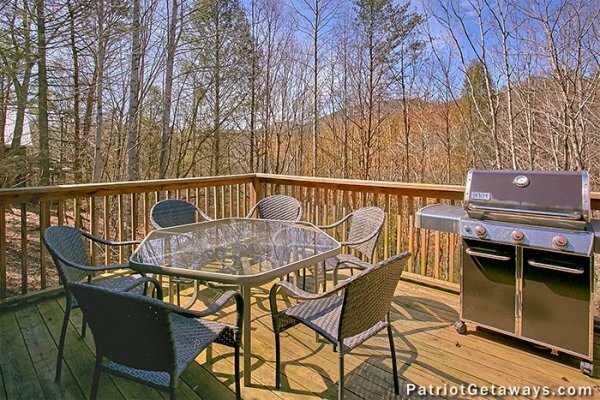 You'll jump for joy when you spend your next Smoky mountain vacation at beautiful STAGS LEAP! 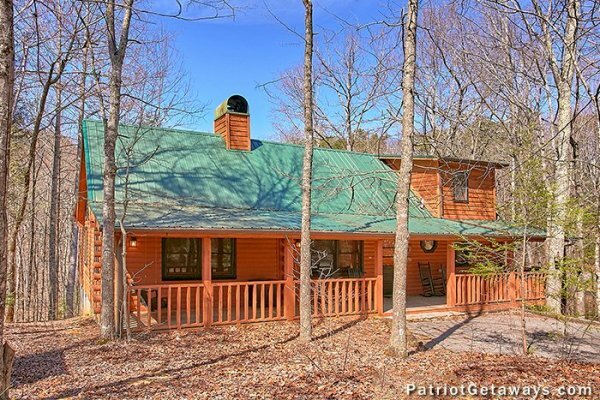 This finely decorated, true log cabin home, is conveniently located off Walden's Creek Rd just 3 miles for all the action in Pigeon Forge on easy driving, paved roads. 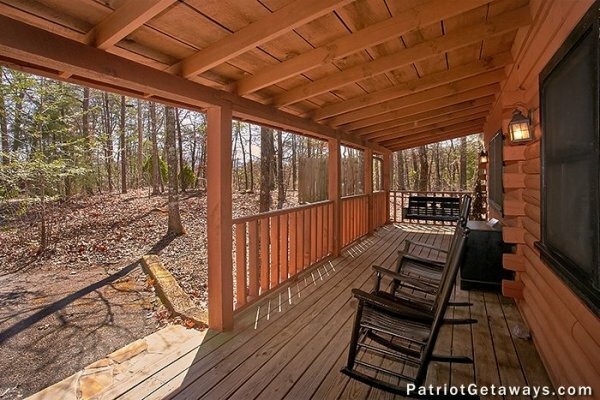 Enter through the full length covered porch with rockers and porch swings into a high vaulted living room with a stone & gas see-thru fireplace. 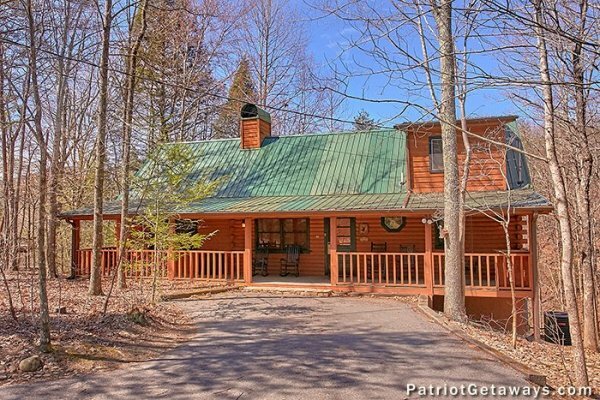 On the other side of the fireplace a SECOND large living room including a game area with pool table provides incredible living space in this oversized 2 bedroom 2 bath cabin. 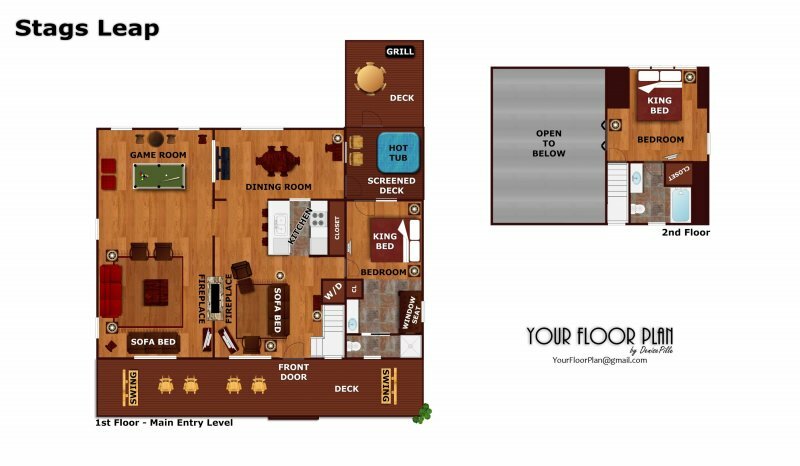 Two King bedrooms with attached baths, and 2 sleeper sofas accommodate up to 8 guests comfortably. 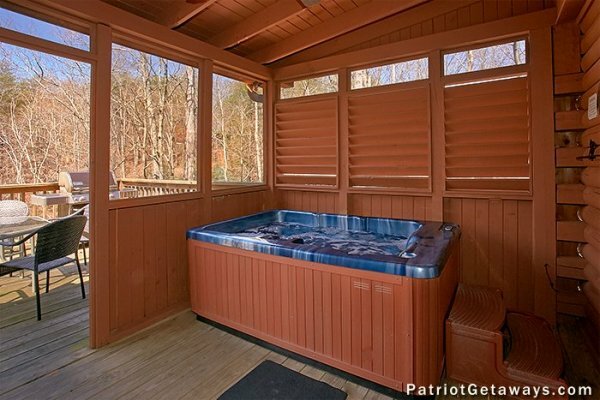 Enjoy the hot tub under the covered porch, or relax with a good book in the stackstone window seat. A fully appointed kitchen is pefect for preparing your favorite recipes. 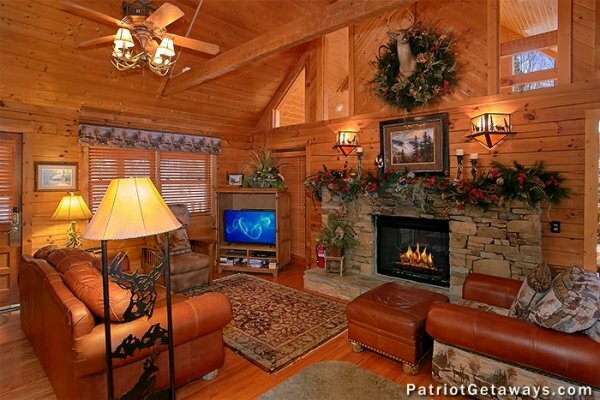 STAGS LEAP is a true luxury mountain cabin with all the amenities of home. Call today to book your stay! We had a pleasant stay. No issues whatsoever with the cabin . 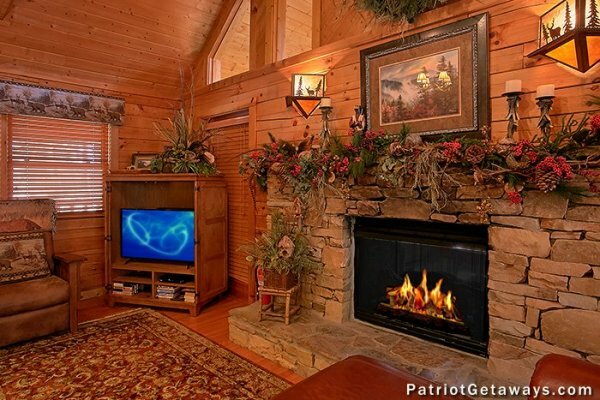 Great cabin,I just wish the fireplace timer would stay on more than thirty minutes. You came highly recommended...we were not disappointed in the least! 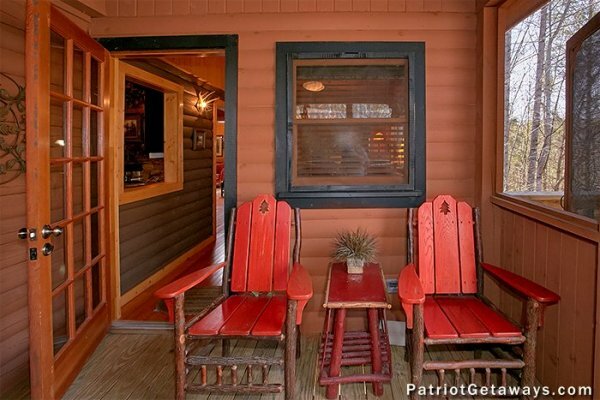 The cabin was beautiful and suited us perfectly. Thank you for the ease of your website, the professional staff, and delivering on your promises. We had a great time! 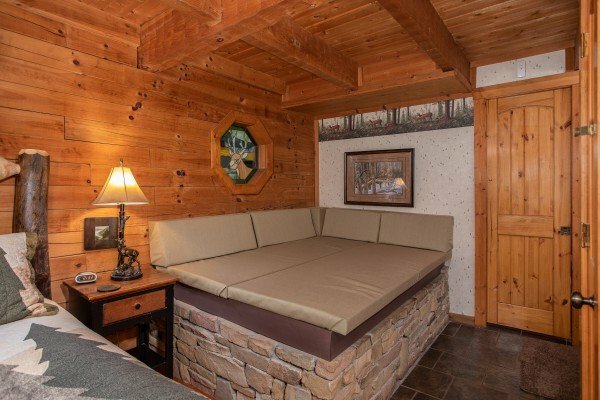 I could not have had a better experience with both ladies that I spoke with to inquire and then later book the cabin. So nice to talk to and helpful. It was a fabulous experience all the way around. I appreciate that even though I was extremely last minute and could not stay two nights, they found me a gorgeous cabin that worked for us. We had a wonderful time in gorgeous surroundings. Will only use you all moving forward! Thanks again! The only thing I had any issues with was finding the WiFi password. I had to call customer service for assistance. We have stayed at Stag's Leap numerous times and once again were not disappointed. 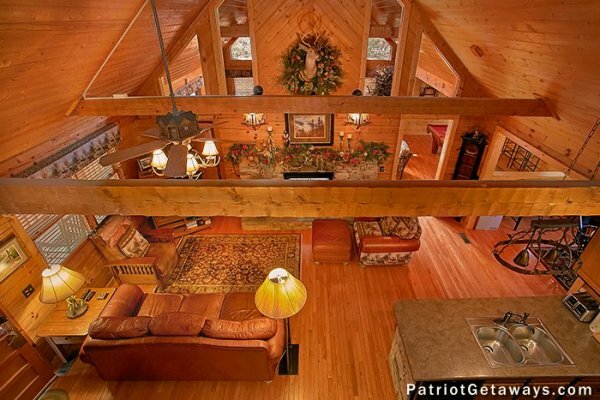 Beautiful cabin and easy to find. Everything you need is there. Thank you so much. 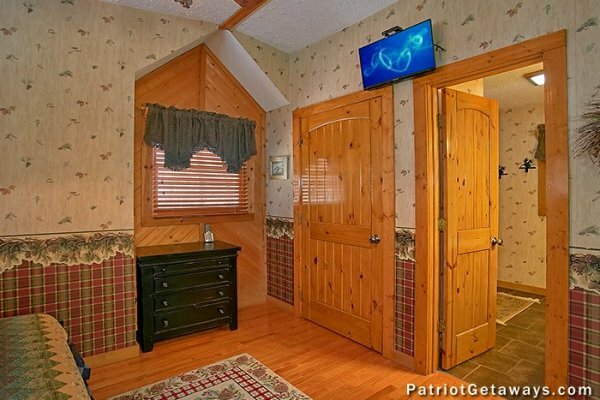 This was the second time we had stayed in this cabin. We liked it so well the first time we came back. Thanks for a very good time. It was a great cabin. 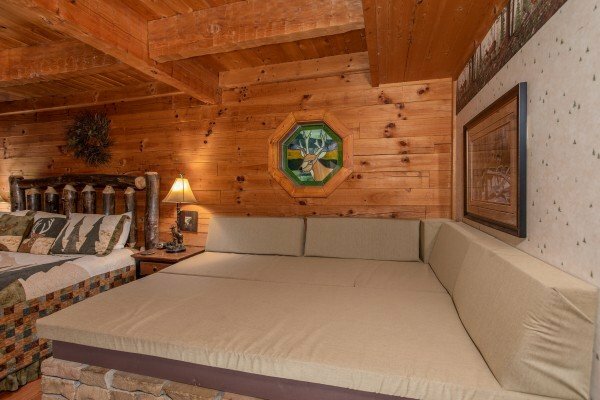 We stayed in the Stags Leap cabin in The Walden Creek area.It was a Beautiful Cabin, even prettier than the pictures. 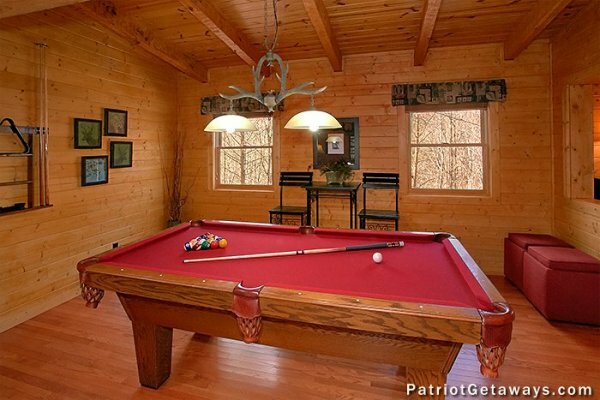 We really enjoyed the tree of critters in the second living room and of course the Pool table which was in great shape. 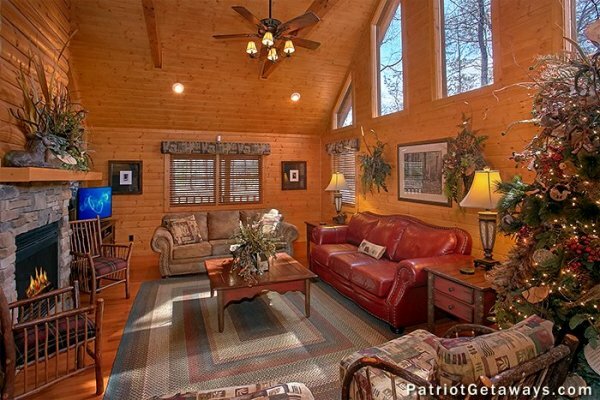 We really appreciated the cleanliness of the cabin and the ease of booking and check-in. 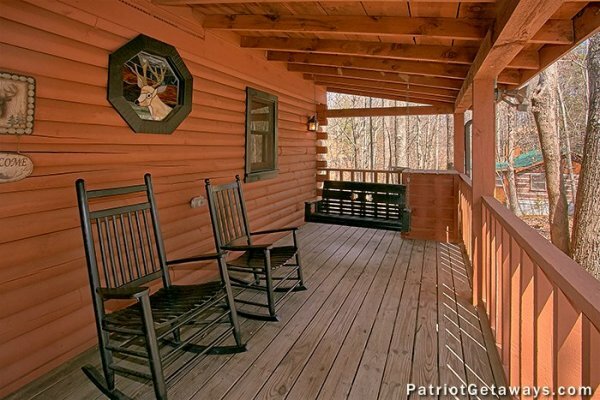 We look forward to vacationing in this cabin again. I have owned my own cabin for 18 years and lost it in the fire. I came down from Michigan and Stayed at Stags Leap while settling issues with the insurance company. 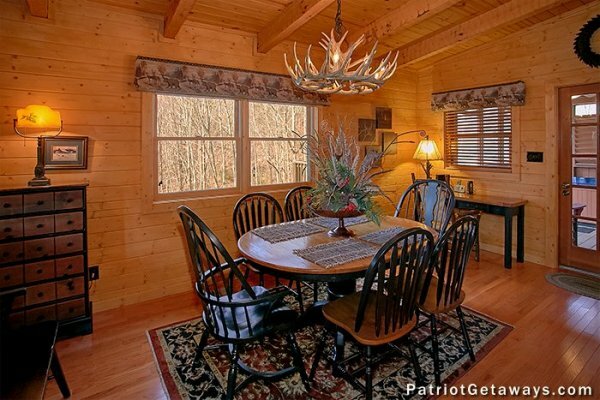 The pride of ownership was clearly evident as the cabin was decorated and outfitted perfectly. 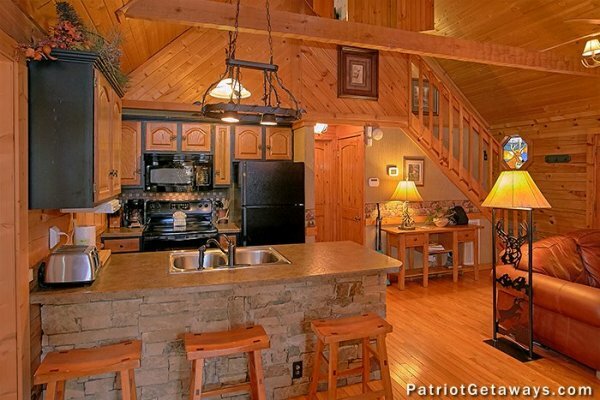 A wonderful place for a family or couples to stay on their visit to the smokies. I didn't have any contact with the staff other than confirming check-in which means everything was completed prior to my arrival. A very pleasant experience. My wife and I fully enjoyed our time at Stags Leap, we wished we had stayed longer. We have used American Patriot before and will again in the future. 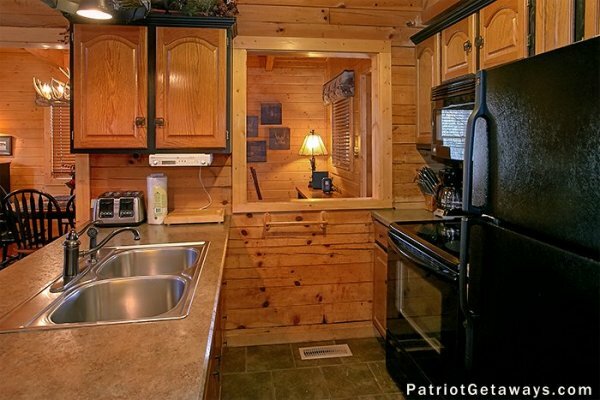 The unit was clean, fully stocked, easy access and close to Pigeon Forge. This trip was for R&R and StagsLeap was a great fit!! Only minor concern was the hot tub, TOO much chlorine, when we turned on the jets it took our breath and we had to get out. Appreciate the cleanliness/health focus!! American Patriot - you continue to set the standard. Loved it! 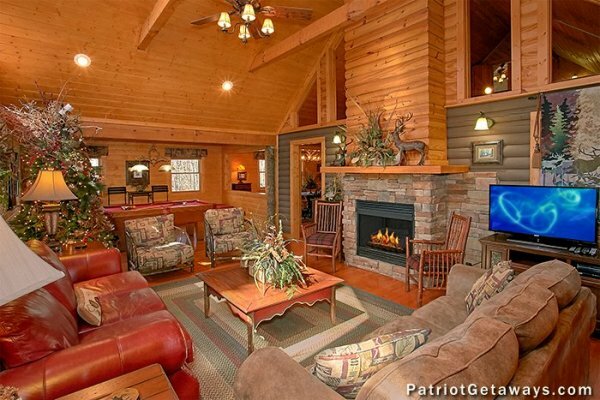 We plan on returning to this cabin again. 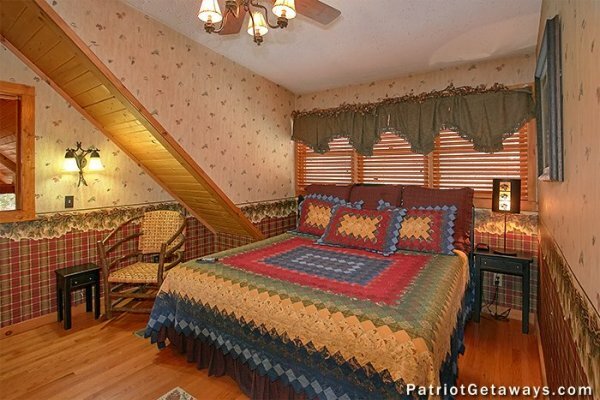 Very nicely decorated and such a perfect quiet atmosphere for the needed relaxation me and my wife were looking for. 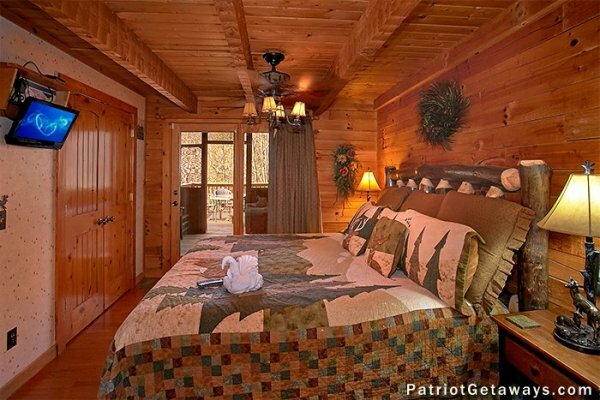 Thanks American Patriot Getaways. Only complaint i have is that we didn't stay long enough!! But everyone enjoyed their stay and had a great time. Spending time with family is all that mattered. Have a blessed and wonderful day! !